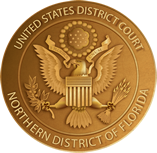 The United States District Court for the Northern District of Florida is honored to take part in the process of Naturalization and has retained exclusive jurisdiction to conduct naturalization ceremonies for applicants seeking citizenship. These ceremonies are presided over by a United States District Judge or Magistrate Judge. The Court only hosts the ceremonies. Scheduling, including who participates in a ceremony, is handled by U.S. Citizenship and Immigration Services (USCIS). USCIS processes all naturalization applications. Once the application has been processed, a list of the candidates selected to be naturalized is provided to the Court. Applicants seeking citizenship will receive their ceremony date and time from the USCIS. For all information on immigration and naturalization issues, including scheduling a new date if you are unable to appear for your scheduled ceremony, please contact USCIS. Naturalization ceremonies in the Northern District of Florida are typicall held in the U.S. Courthouses in Gainesville and Tallahassee. Pensacola and Panama City ceremonies vary in location. Please see the Naturalization Calendar for detailed information on specific ceremonies. On the day of the ceremony, applicants are processed by USCIS Officers and Deputy Clerks of the Court. Petitioners should arrive at the location of their ceremony at the date and time stated on their Notice of Naturalization Oath Ceremony form (Form N-445) to ensure enough time to complete the check-in process. Upon entering the courthouse or ceremony venue, everyone is required to pass through a security screening. Please allow extra time for the screening process. Each petitioner should bring photo identification, the U.S. issued “green card," U.S. issued visa, any other immigration or travel documents you may have, and your Notice of Naturalization Oath Ceremony (Form N-445). A petitioner who is not fluent in English, but who is age 55 or older and has a U.S. permanent residency of more than 20 years, may be accompanied by someone who can interpret in the petitioner’s native language. Naturalization ceremonies will begin at the time stated on the naturalization ceremony calendar, which is usually 1 1/2 to 2 hours later than the check-in time stated on the Notice of Naturalization Oath Ceremony form. The ceremonies are open to the public, and friends and family of petitioners are invited into the courtroom to witness the petitioners swear the Oath of Allegiance to the United States of America. Children are welcome to attend the ceremony, but parents should remove children whose behavior disrupts the ceremony. Please note that naturalization ceremonies are one of the rare occasions when cameras and video recorders are permitted inside the courthouse. However, cell phones are not permitted inside the courthouse at any time. Please leave your cell phone at home or in your vehicle. Everyone entering a federal courthouse is expected to comply with federal court rules and any other rules of the court. Please remain quiet during the proceedings and stand when the judge enters or leaves the courtroom. If you must leave while court is in session, please exit quietly. *Upon entering the courthouse, everyone is required to pass through the security screening. Questions? If you need more information about naturalization ceremonies in the Northern District of Florida, please use our online contact form.